In the wide range of Buddhist meditation and spirituality a very special place is held by the practice of calling on the name of Amitabha, or in Japanese Amida Buddha, using the simplest of formulas, the nenbutsu. Japanese masters such as Honen, Shinran and others made this the core of a profound spiritual experience which has fascinated numberless followers ever since. The deeper meaning of the nenbutsu has therefore become a major topic in Buddhist thought which has been reflected on by various thinkers and teachers to this day, especially in the context of Shin Buddhism. 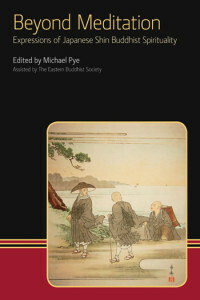 In this book, which draws on classic articles first published in The Eastern Buddhist, major historic proponents and masters of the nenbutsu are introduced, in particular Shinran, Shoku, Ippen and Rennyo. Further contributions, which set the work of these masters into the wider context of Buddhist tradition, are in fact some of the earliest Buddhist “voices” to emerge from modern Japan into global view. Yet the presentations of writers such as Sasaki Gessho, Yamabe Shugaku and Sugihira Shizutoshi have a freshness and an immediacy which speaks to us today. A detailed glossary, index and bibliography complete what is a very interesting, enlightening and challenging book. While it cannot be said to be an easy read, it is accessible to the non-specialist, and deserves to be on the bookshelves of all Shin Buddhists. I am definitely going to read some of the articles again and look forward to doing so.